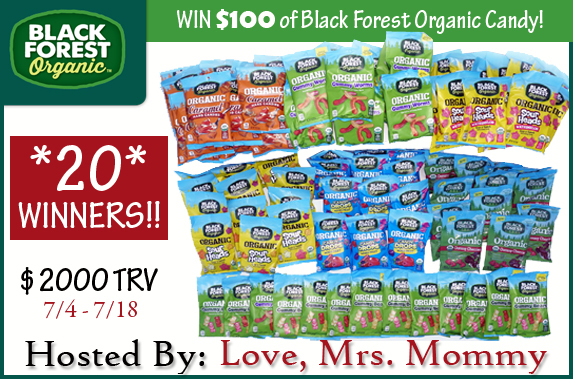 Welcome to the Black Forest Organic Candy Giveaway! This is such a fun giveaway. Chances are, you've probably tried Black Forest Organics before. They personally offer my favorite gummy bears of all time! I am a serious fan! So I had to jump on this giveaway opportunity! Can you imagine how much candy comes with a $100 prize pack? I'm jealous of the 20 winners! Such an awesome prize! Anyway - Have fun entering! There will be a whopping 20 winners on this one! Black Forest Organic makes mouth-watering candy using only premium ingredients that they scoured the globe for. In 2015, they set off to make the world’s most uncompromisingly delicious candy. They are committed to making only USDA Certified Organic candy, and believe in a small batch process, that delivers big flavor at a sensible price. How could you not be excited over that?!"